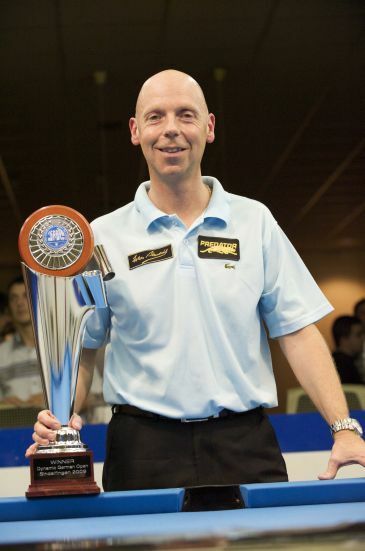 Ralf Souquet from Germany won the 2009 German Open. In the final Souquet defeated England's two-time ET winner Imran Majid 8-4 to claim the €5000 first prize. Majid received €3300 for second place. Souquet defeated countryman and defending champion Thomas Engert 8-3 in the semifinals. Majid edged surprise man Michal Czarnecki (Poland) 8-6. This was the first ever 10-ball event on the Euro Tour and what could be more fitting than the all-time leader taking the title. This was his 16th win from 26 finals. Fellow German Oliver Ortmann is second on the list with 13 wins. The German legend is on an amazing run. His last six finishes on the Tour is 5th, 1st, 1st, 5th, 3rd, 2nd and 1st. Souquet extends his already massive lead in the Euro Tour Ranking. Majid improves from seventh to fourth. The Dutch pair of Niels Feijen and Nick van den Berg hold on to second and third place respectively. The tournament was played 21-23 May at Billiard Cafe Die Drei, Sindelfingen, Germany. It was the third event of seven on the 2009 Euro Tour. Next up is the Patricks Austria Open which runs from August 20-22 2009. It will be the 100th event on the Euro Tour.